The Kanakakkunnu Palace listed as a heritage monument by Indian National Trust for Art and Cultural Heritage (INTACH) now has a unique model of conservation of biodiversity and ecosystem management. THIRUVANANTHAPURAM: There may be times when you took a walk through the Kanakakkunnu Palace and was inquisitive to know the name of a particular tree or garden species you found interesting but had to return back without getting any information. However, now, you can avail the details of the tree or garden species just by scanning the QR code stuck on it. The Kanakakkunnu Palace listed as a heritage monument by Indian National Trust for Art and Cultural Heritage (INTACH) now has a unique model of conservation of biodiversity and ecosystem management. Although it is one of the most visited places because of its rich heritage, there has been no proper study done on the plants here and not a single one was labelled in the palace premises. Now each plant is labelled and one just needs to scan the QR code stuck on each plant with the help of their smartphones and obtain the necessary details which include the photos, uses, flowering period, distribution, nativity and also the botanical characters of the plant species. The QR code gets translated to the URL of the website concerned with the flora of the Kanakakkunnu palace. This has been made possible by Akhilesh S V Nair who is pursuing his MSc Genetics and Plant Breeding from the department of botany, University of Kerala, Karyavattom who has documented 126 tree and garden plant species of the palace premise including the Nishagandhi and Sooryakanthi grounds. “Now as the plants have been digitised, the visitors can learn more about the biological diversity. With this, the palace has become the first public place in the state to get a digital flora,” said Akhilesh. The documented data were digitised creating a blog -'Tree and Garden Plant Species of Kanakakkunnu Palace, Thiruvananthapuram with the link http://asvnairflora.blogspot.com/. All the data were digitised through a website, QR code linking and Android app creation under the guidance of A Gangaprasad, assistant professor of the department. The concept of digital flora and garden is new to plant taxonomy. Linking taxonomy with technology is one of the promising fields having immense application. The entire data has been digitised in the form of a blog hence any person interested in the plant can access the blog freely. In the blog, each plant species are recorded on separate pages with unique URLs. In the app, the scientific name, local name and also a photo of the species is provided. 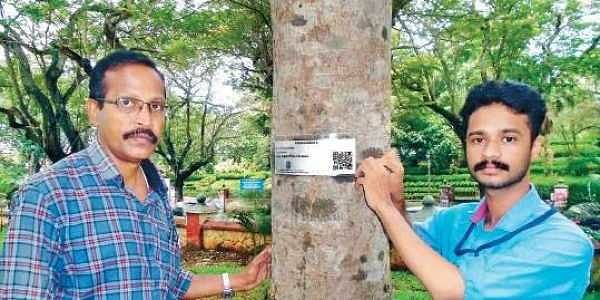 Already labels with QR codes have been placed on 68 trees. “But placing labels on exotic and ornamental plants is not possible," said Akhilesh. The tourists have already started scanning the QR codes and obtaining the necessary information. Other than the QR codes, a download link for another app,'Golden flora', is also provided, on the bottom of each page. This app provides the entire listing of all the plant species on the palace premises.